National reports published annually by Transport Research Wing of the Ministry of Road Transport & Highways and National Crimes Records Bureau of Ministry of Home Affairs, Government of India describe national statistical trends and normalized indicators of road accidents, injuries & fatalities. This article highlights trends, indicators, interstate comparisons and the latest characteristics of road traffic accidents in India. While the official road traffic fatality data may be close to the actual number, the injury data are gross underestimates. As per bibliometric analysis, India contributed only 0.7 per cent papers on road traffic injuries and had less than one article on road traffic injuries per 1,000 road traffic related deaths. To be effective, policies on injury prevention and safety must be based on local evidence and research. Health professionals and their professional bodies across wide disciplines need to take an initiative for the same with active commitment. These reports fulfil a wide variety of data requirements of all the stakeholders like policy makers, police leadership at various levels, transport departments, road safety professionals, researchers, academia, media, NGOs and others. 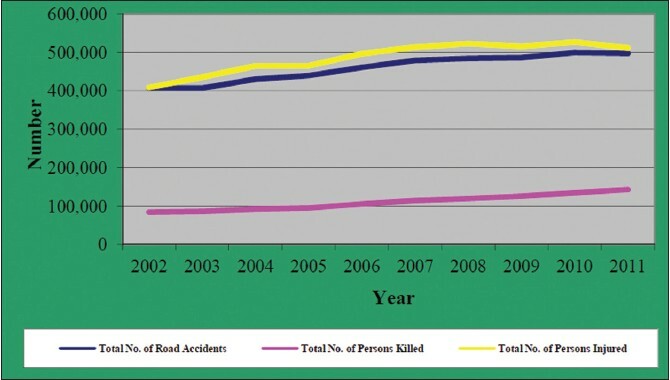 To get an appropriate measure of the incidence of accidents, the normalized/standardized accident rates for India have been worked out in terms of the number of accidents/injuries/fatalities (a) per lakh persons (b) per ten thousand motor vehicles and (c) per ten thousand kilometres of road length. A significant decline in the number of accidents per ten thousand motor vehicles is discernible from 814.4 in 1970 to 35.1 in 2011. There has been more than a three-fold increase in the number of persons injured per lakh of population from 13 in 1970 to 42.3 in 2011, while persons killed per lakh of population jumped four-fold from 2.7 in 1970 to 11.8 in 2011. Exposure of population to road accidents leading to deaths and injuries largely depends on the amount of travel undertaken, defined as the number of trips, the distance traveled or time in the road environment, number of motor vehicles and the amount of motorized traffic, and so on. 1. Transport Research Wing, Ministry of Road Transport and Highways. 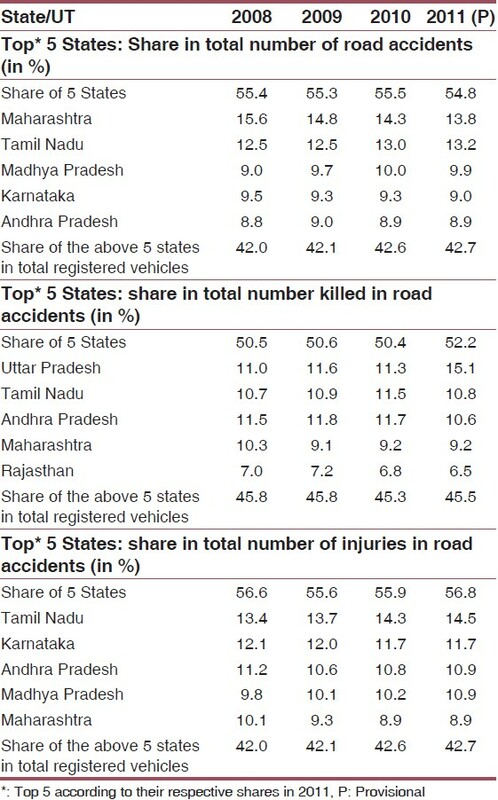 Road Accidents in India 2011. New Delhi: Ministry of Road Transport and Highways, Government of India; 2012. 2. World Health Organization. Estimates of mortality by causes for WHO member states for the year 2008 summary tables. Geneva: WHO; 2011. 3. United Nations Decade of action for road safety 2011-2020. Available from: http:// www.decadeofaction.org [Last accessed on 2013 Jul 15]. 4. World Health Organisation. Road Traffic Injuries Fact Sheet N 0 358, March 2013. Available from: http://www.who.int/mediacentre/factsheets/fs358/en/ [Last accessed on 2013 Jul 15]. 5. United Nations Road Safety Collaboration. Available from: http://www.who.int/roadsafety/en [Last accessed on 2013 Jul 15]. 6. Ministry of Health and Family Welfare. Integrated Disease Surveillance Project- Project Implementation Plan 2004-2009. New Delhi: Government of India; 2004:1-18. 7. Gururaj G. Road traffic injury prevention in India. Bangalore: National Institute of Mental Health and Neuro Sciences, 2006; Publication No 56. 8. Transport Research Wing, Ministry of Road Transport and Highways. Status paper on road safety in India 2010. New Delhi: Ministry of Road Transport and Highways, Government of India; 2010. 9. National Crimes Records Bureau. 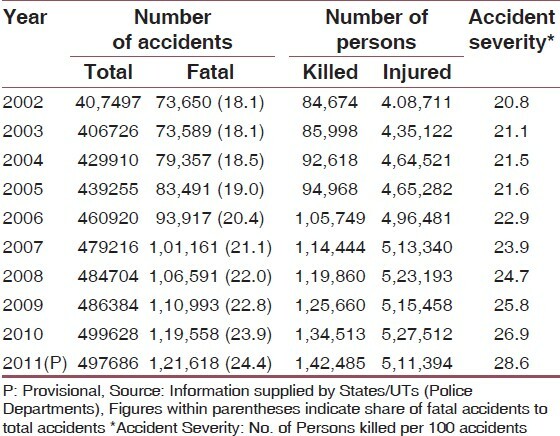 Accidental Deaths and Suicides in India 2012. New Delhi: Ministry of Home Affairs, Government of India; 2013. 11. Mohan D. Road accidents in India. IATSS Res 2009;33:75-9. 12. Gururaj G. Road traffic deaths, injuries and disabilities in India: Current scenario. Natl Med J India 2008;21:14-20. 13. Kuchewar SV, Meshram RD, Gadge SJ. Demographic study and medico-legal aspect of fatal road traffic accident in Aurangabad. J Life Sci 2012;4:7-10. 14. Khan MK, Hanif SA, Husain M, Huda MF, Sabri I. Pattern of non-fatal head injury in adult cases reported at J.N.M.C. Hospital, A.M U, Aligarh. Indian Acad Forensic Med 2011;33:21-3. 15. Fitzharris M, Dandona R, Kumar GA, Dandona L. Crash characteristics and patterns of injury among hospitalized motorised two-wheeled vehicle users in urban India. BMC Public Health 2009;9:11. 16. Sarangi L, Parhi L, Parida RK, Panda P. A Study on epidemiological factors associated with road traffic accidents presenting to the casualty of a private hospital in Bhubaneswar. Indian J Community Med 2009;5. 17. Dandona R, Kumar GA, Raj TS, Dandona L. Patterns of road traffic injuries in a vulnerable population in Hyderabad, India. Inj Prev 2006;12:183-8. 18. Verma PK, Tewari KN. 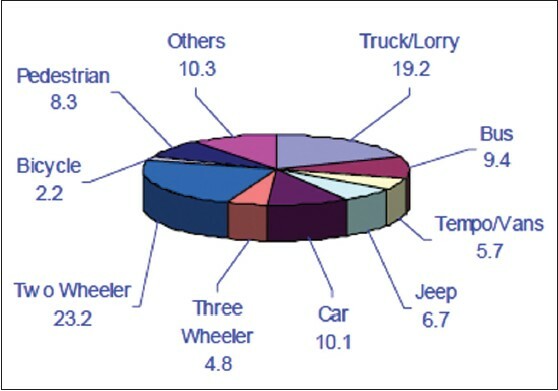 Epidemiology of road traffic injuries in Delhi: Result of a survey. Regional Health Forum WHO South-East Asia Region 2004;8. 19. Shrinivas PL. Studies undertaken to identify critical causes of accidents in the highways of Tamil Nadu. Indian Highways 2004;31:11-22. 20. Jha N, Srinivasa DK, Roy G, Jagadish S. Injury pattern among road traffic accident cases: A study from south India. Indian J Community Med 2003;28:85-90. 21. Varghese M, Mohan D. Transportation injuries in rural Haryana, North India. In: Proceedings of the International Conference on Traffic Safety. New Delhi: Macmillan India 2003; p. 326-9. 22. Gururaj G. Epidemiology of road accidents and head injuries in Bangalore. Bangalore: National Institute of Mental Health & Neuro Sciences 2001. 23. Gururaj G, Thomas A, Reddi MN. Underreporting of road traffic injuries in Banglore: Implications for road safety policies and programmes. In: Proceedings of the 5 th World conference on injury prevention and control. New Delhi: Macmillan India; 2000. 24. Borse NN, Hyder AA. Call for more research on injury from the developing world: Results of a bibliometric analysis. Indian J Med Res 2009;129:321-6.